Daniel Levitin wants us to eat our spinach, an unsavory chore for an increasingly innumerate society. Yet we need the critical thinking he advocates to cut through the tangle of mistakes, manipulations, and outright lies encountered in everyday life. “Just because there’s a number doesn’t mean that the number was arrived at properly,” says Daniel Levitin, the prolific musician, neuroscientist, and educator at McGill University. His Field Guide to Lies lays out three kinds of misinformation: numerical, verbal, and scientific. It serves as a kind of Strunk & White for sloppy thinkers. Learning how to figure probabilities and weigh statistical claims in one’s head may be a slog, but Levitin shows why the effort is worth it. We are easily swayed by first-person accounts rather than evidence. We tend to be pigheaded once we form a belief, and it is hard to let go even when challenged by evidence to the contrary. The claim that vaccines cause autism, for example, not only proved to be bogus, but the researcher falsified the data to begin with and his medical license was revoked. Despite a thorough debunking, some parents still believe vaccines are dangerous. “Science and life are not static,” Levitin reminds us, and critical thinking isn’t something you do once and then forget. People lie for a variety of reasons. Circumstances change. There are always alternative explanations. “Solutions that should be scientific or technical” can actually be political. It behooves us to know how to tell. The book offers an array of plausibility checks. The biggest pitfall is that our brain largely decides based on emotional considerations, which it then seeks to rationalize and justify. Medical decisions are nervewracking if we do not know how to weigh unfamiliar options and those that don’t have sharply defined answers. A positive test result does not mean you definitely have a particular disease. By working out the actual probabilities Levitin shows how many remedies that look appealing can actually make matters worse. He explains why a single experiment gives us little useful information, and why it is the collective meta-analysis of aggregate studies that is “the real currency of science.” It is easy to lie with statistics and graphs because few people bother to learn how they work. But statistic are not facts. They are interpretations made by people—and it is people who determine what to count and what to omit. Commonly misused terms such as “average” can mislead. “On average, humans have one testicle,” is a valid but absurd fact that reminds readers that averages say nothing about the range. The average life expectancy has gone up not because previous generations didn’t make it to old age, but because high childhood mortality skewed the average. True causes can easily be hidden in the numbers. “Significant” doesn’t mean noteworthy or important (it only shows how easily chance alone can explain an observation). “Probability” can be used to mean different things, assumptions are almost never stated explicitly, and beware of terms that are left undefined (What exactly does “sexually active” mean?). Beware, too, of pundits, because an expert in one field is not automatically an expert in another. The questions that polls ask are the tiniest slice of those that could have been asked, and the reported results a miniscule sample of respondents’ possible attitudes and experiences. Small samples are rarely if ever representative. The text gets drier as it expands into topics like bimodal distributions, spurious coincidences, and irrational biases (your chances of being killed on a single flight on a major airline are one in five million, “making it more likely that will be killed doing just about anything else”). 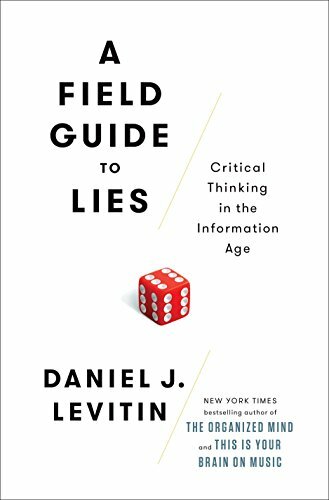 Offering up far more than most readers will likely be able to digest, Levitin’s Field Guide to Lies may come close to Stephen Hawking’s Brief History of Time in being a book that is more purchased than actually read.